Last year in Bangalore, Taj Hotels opened up a 200-room luxury business hotel that boasts a bright, colorful facade and a green roofed promenade inspired by the mobius strip that wraps around the public amenities of the hotel. 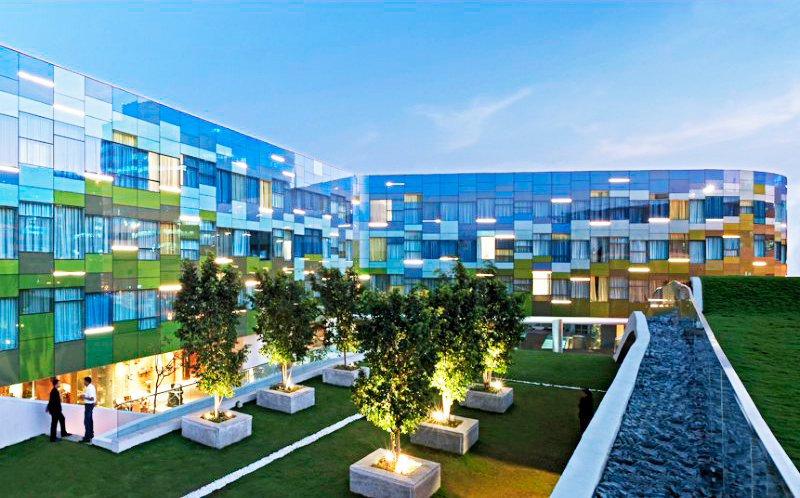 WOW Architects and Warner Wong Design of Singapore designed Vivanta Hotel in order to cater to the many IT professionals and companies in the nearby International Tech Park Bangalore (ITPB), India. The green-roofed contemporary hotel is designed to act as a contemporary socio-cultural hub while serving a younger crowd of business travelers. Rooms at the Vivanta Hotel are located in the brightly colored tower with views overlooking the green roof promenade below. Each room is designed specifically with the modern-day nomad in mind – the live/work apartments make business travel much more comfortable. The naturally-lit rooms are conserve space and have zones designated for work and relaxation. Guests of the hotel also have many options for socializing around the hotel in the various open bars, restaurants and the green roof promenade. The green roof tops the open-air bar, providing insulation and reducing heat gain to keep the space underneath cool. Rainwater is also harvested from this ground plane and used to irrigate the landscape. The beautiful and colorful facade of the building, which fades from green to blue to represent the shift from the ground to the sky, was specially designed to minimize heat gain in the hotel rooms. The facade is composed of highly-reflective glass with both dark and light tints in order to achieve the overall thermal transfer value (OTTV) desired for the building. Since the hotel’s completion in January 2009, it has garnered five design awards, including Building of the Year for the 10th Singapore Institute of Architects (SIA) Architectural Design Awards 2010. The contemporary luxury hotel was completed in 2009 and is located near the International Tech Park Bangalore (ITPB), India. Designed for a younger generation of business and high-tech professionals, the hotel was is a contemporary socio-cultural hub for the IT-based population in Whitefield. Various outdoor and public spaces allow guests to socialize, work, or relax away from the office or as they travel for business. A large open-air bar next to the outdoor promenade provides a good spot for professionals to meet together and socialize after work. The building embraces Bangalore’s culture and climate, adopting a site-specific landscape strategy that plays with transparency and relationships between interior and exterior spaces. Public and private spaces mix together in a continuous promenade of spatial experiences inspired by the circling and twisting of traditional Indian dance forms. The hotel's ground plane was designed like a mobius strip to create a public promenade creating a connection between the many public spaces and private areas. The material palette for both exterior and interior, including the selection of fabrics, was kept sensitive to the local conditions of supply and procurement. These maneuvers avoided the extensive carbon expenditure of importing materials from outside South India. The hotel is largely constructed out of concrete and glass and workmanship defects were embraced as part of the aesthetic through finishes that celebrate the raw and rustic look. The colorful glass facade is composed of both dark and light tinted glass in order to minimize heat gain through the windows into the hotel rooms. Each room is designed specifically with the modern day nomad in mind - the live/work apartments make business travel much more comfortable. Views from inside the rooms look down on the large green roof promenade that covers the public spaces. 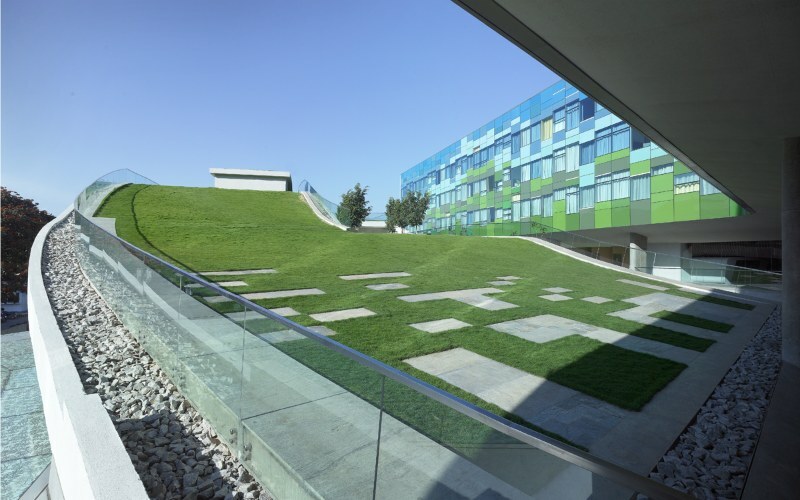 The green roof protects the spaces underneath from heat gain and also collects rainwater for landscape irrigation.